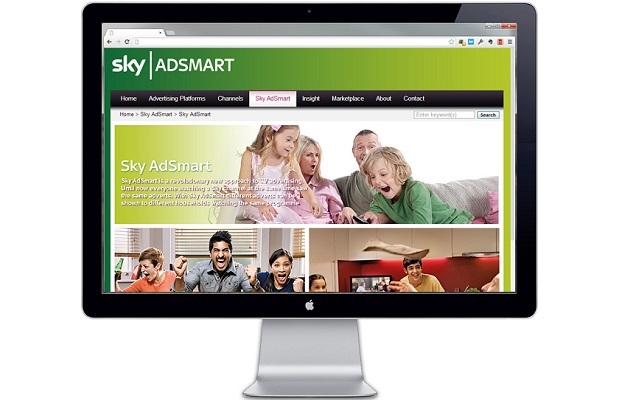 Entries from Digital Intelligence tagged with "virgin"
Sky and Virgin Media in talks over a deal to join forces in the advertising market via the Adsmart network, in a bid to tempt spending away from Google and Facebook. Digital solutions firm Acquia, has been hired as the technical lead on delivering Virgin Sport’s new festival platform. Virgin Train has teamed up with Trainline to become the first operator to give customers the option to add train tickets straight to their Apple Wallet on its west coast route. Virgin Media has become the first brand in the UK to use Virtual Reality to place viewers directly into the middle of a TV advert. 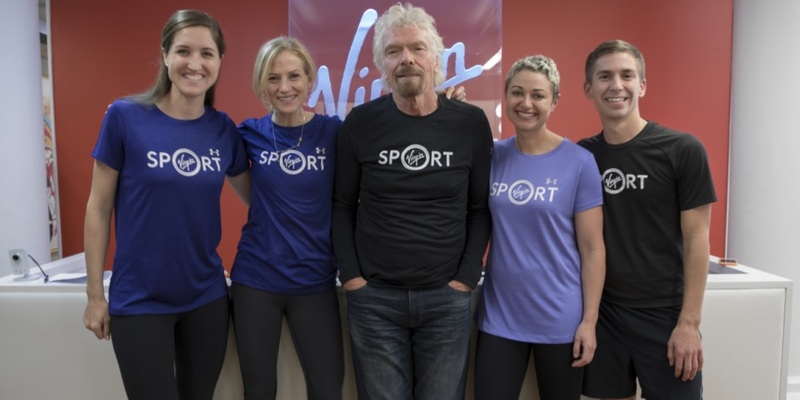 To coincide with the surge in New Year’s gym sign ups, Virgin Active has created an ‘emojivation pack’ to help people share how they get active across social media platforms. Gym brand Virgin Active has embarked on a new digital push, with a digital wristband that tracks movement alongside ‘virtual fitness’ classes. UK 4G mobile operator EE is to launch a fixed-line TV service, competing with BT, Sky, YouView, Virgin Media and TalkTalk. According to a recent study by Google and Millward Brown Digital, holidaymakers are increasingly comparing before booking a trip. As part of their digital holiday hunt, they use a variety of devices turning looking for the next trip abroad into a multi-device experience. 67% of the users start a search on their mobile phone, keep looking for information on a tablet, and finally complete a purchase on their desktop PC. Virgin Atlantic staff are being equipped with Google Glass and Sony Smartwatches to help keep passengers up-to-date with information and aid with translation issues. Virgin Mobile USA has launched an interactive video campaign which a viewer can control simply by blinking- provided they are using a webcam. Virgin Media and Two Way Media have launched of a new casual TV gaming portal, Play Games. US cable giant Liberty Global has bought Virgin Media for $23.3bn, creating the largest broadband company in the world on terms of customer and country reach. The BBC is updating its Red Button service to work with next generation of internet-connected TVs. Dubbed the ‘Connected Red Button’, the new service lets viewers with internet-enabled TVs watch some channels even if they are off air and catch up with previous episodes of shows. Virgin Media has announced plans to introduce a free Wi-Fi network in London to allow the city's population and commuters unlimited access to the Internet at no cost. The network will allow anyone who needs to get online the ability to browse the web and check their emails at a speed of 0.5MB, while subscribers to Virgin Media's broadband packages will be able to log in and boost their connection to 10MB. As the possibility of industrial strike action looms over its customers this summer, Virgin Atlantic is faring better online, making significant improvements to its website and mobile app to replace its strike-hit competitor, British Airways, at the top of the travel website usability stakes, according to a new study. The 2011 Flights Online Report from user experience consultancy, Webcredible revealed that with an overall score of 82 per cent, Virgin Atlantic has, for the first time wrestled the top spot from British Airways, which scored 80 per cent on its website usability this year. Microblogging phenomenon, Twitter, celebrated its fifth anniversary this Monday (21 March 2011). A new report from Virgin Media Business has revealed that 35 per cent of organisations in the UK are using social networking sites as part of their external communications, with one in ten firms now tweeting regularly. After years of anticipating the mobile web, it seems most marketers are struggling to make it work for them. Latest research here in the UK revealed half of firms don't check their sites on mobiles - and we'd speculate that for those that do the findings can be pretty uncomfortable. Most brands fail to ensure their sites work well on mobile browsers, and fail to give consumers what they're most likely to be looking for on the move. Digital strategies need to play to the consumer's mindset as well as the strengths of the channel, and like the early days of the web, more brands get it wrong than right. Exceptions include Gap in the US, where this month their Facebook places promotion (10,000 jeans for the first 10,000 consumers to use their mobiles to 'check-in' at their checkouts) was clearly a great route to crowd-sourcing in mobile social spaces, creating 10,000 signposts for other consumers to follow. Facebook also had us adding more 'fan' badges as their online ad targeting propelled them to take nearly a quarter of US web display ads. For media planners the offer of campaigns with almost no media wastage is intoxicating, and even the British Royal Family are now targetable - embracing Facebook with the launch of their first monarchy page; time to become 'Friends' maybe? And finally if you're a busy digital exec planning to escape off the grid this Christmas, rest assured you can now check your emails even while climbing Everest - thanks to the Nepalese telco planting the mountain's first 3G base station. You never need be away from email again! 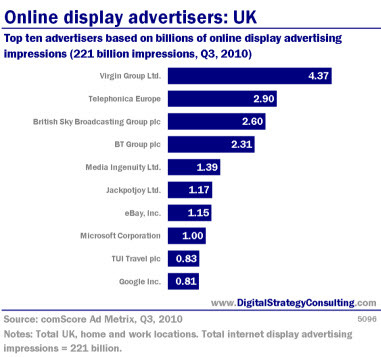 Top ten advertisers based on billions of online display advertising impressions (221 billion impressions (221 billion impressions, Q3, 2010).